Analysts and experts focused on the war in Ukraine believe a number of factors are combining to keep the Ukrainian conflict on the global diplomatic back burner. 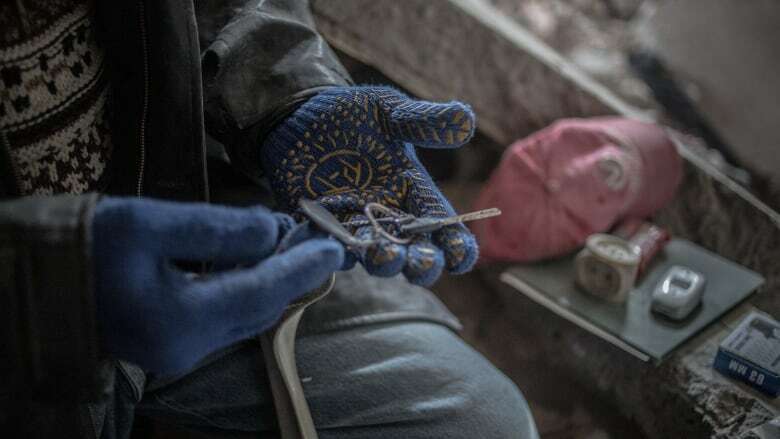 On Feb. 19, one day before the latest attempt at a ceasefire in Ukraine, 51-year-old Vitaliy Yermolovich sat in the ruins of his home in Avdiivka in eastern Ukraine and laughed. "So, it'll be the 30th ceasefire?" he said, looking toward his neighbour, Telman Salimov, who fled the conflict in Karabakh nearly 30 years ago for the safety of Ukraine. Salimov ignored the question, remaining focused on the emergency workers below who scurried between massive slabs of cracked concrete and debris. 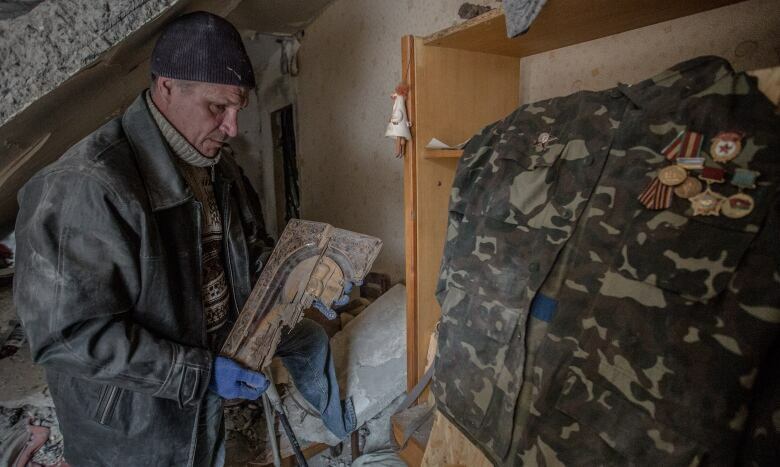 They steadfastly searched for any documents that might have survived the late afternoon shelling, which simultaneously destroyed four apartments. The war in eastern Ukraine began in the early spring of 2014 after Russia annexed Ukraine's Crimean peninsula and quietly began sending troops and military equipment across the border into Ukrainian territory. Combined Russian-separatist forces have fought the Ukrainian military since the spring of 2014. The fighting has now taken the lives of more than 9,750 people according to official UN figures, and more than 1.8 million people have been displaced in that time. CBC News spoke with a bevy of analysts and experts focused on the war who believe a number of factors are combining to keep the Ukrainian conflict on the global diplomatic backburner. 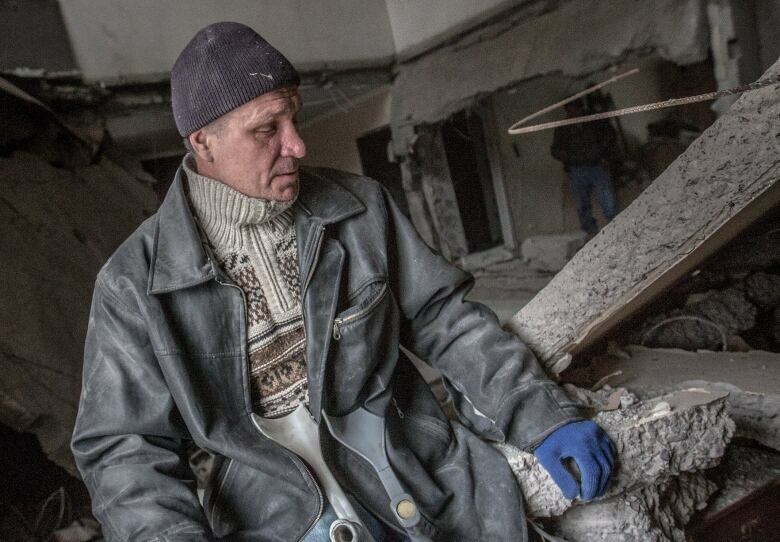 While Yermolovich lost his leg fighting as a Soviet soldier during the war in Afghanistan, he's now lost his home in the third year of Ukraine's war with the combined Russian-separatist forces. 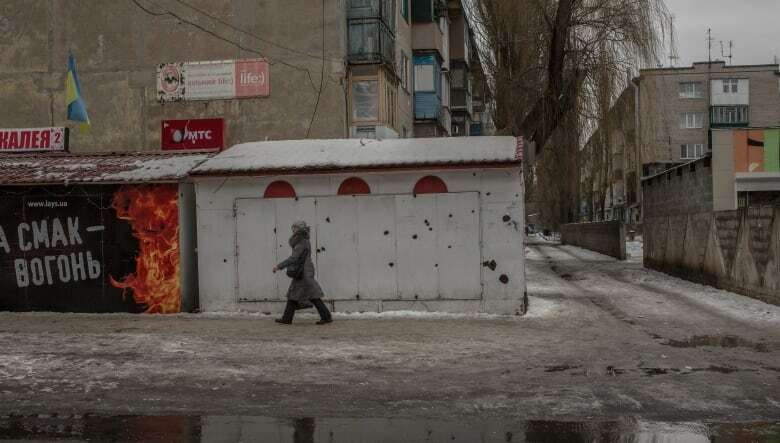 Just three weeks ago, this town of 20,000, which is controlled by the Ukrainian government, was the focal point of the most brutal and indiscriminate shelling since February 2015. In just one week, dozens of soldiers and civilians were killed, many more wounded, and an estimated 200 homes hit by shelling. Although the fighting has slowed down since that deadly week, it never stopped, and shells once again crashed into the city centre. Sitting on a collapsed concrete slab that once served as his ceiling, Yermolovich lights a cigarette in the thick dust clouding the home. "I can understand war in Afghanistan or Syria," he says. "But in Ukraine? No. It'll never make sense to me." His neighbour Salimov yells with sarcastic excitement as two emergency workers discover a single, barely damaged flip-flop. At this point, anything that can be salvaged is a win for the two men and their families. "I just thank God that no one died. I don't know even how it's possible," says Salimov. His two boys, aged 15 and 20, were sitting in their rooms when a shell broke through the building, causing a wall to collapse onto them. They both escaped with relatively minor injuries. "I hate coming back here, it's terrifying." says Salimov's 20-year-old son, Elman, who studies at a university in Kharkiv, some five hours away. "But it's worse being at school and knowing they're still here." Yermolovich's pessimism about another ceasefire attempt was proven correct when fighting broke out again on the day the ceasefire was supposed to take effect. According to experts, there's no reason for optimism anytime soon. "The end game for Russia is not about gaining more control over the occupied territories or gaining more territory," says Alex Kokcharov, a London-based country risk analyst at IHS Markit who has closely followed the conflict since it began. "They want to keep Ukraine in the Russian sphere of influence. Russia's interest is to have this conflict, which it can re-escalate and de-escalate as it wants." Russia's ability to escalate and de-escalate at will is exacerbated by the fact that neither side is willing to compromise enough to reach a political settlement, says Mark Galeotti, a senior research fellow at the Institute of International Relations in Prague. "Russia is not going to pull out, certainly not on Putin's watch and Minsk 2 is dead but no one is going to admit it," says Galeotti, a world-renowned expert in the Russian military and organized crime. "I honestly, sadly, don't see where this conflict can go." The terms of Minsk — the peace agreement signed in February 2015 — call for the pullout of Russian troops and equipment, which Russia still denies are there, despite overwhelming evidence to the contrary provided by a neutral conflict-monitoring body, the OSCE. Perhaps the most important new development is the Trump administration's chaotic start, says Gustav Gressel, a senior policy fellow at the European Council on Foreign Relations. "While there still seems to be some infighting in the Trump administration on how to deal with Russia, Ukraine is out of the focus for the U.S.," he says. "The 'moderates' are trying to save the American commitment to NATO, but Ukraine is beyond that effort." Galeotti agrees, adding that "when America looks so uncertain, the best that Europe can really do is hold the line." And holding the line is tough enough in many European capitals, especially Brussels, according to Galeotti, especially when so many EU officials don't think Ukraine's government is worthy of increased support. The reason for their lack of faith stems from the fact that Ukrainian officials haven't kept up with their promises, says Michael Kofman, a public policy scholar at the Washington-based Wilson Center. "There is a structural trend here of Europeans tired with Ukraine, its glacial pace of reforms, and its intransigence on a number of issues." Further, a recent move by Vladimir Putin to recognize passports issued by separatist authorities in eastern Ukraine seems to indicate that Russia is giving quasi-legitimacy to those areas as their own independent republics, Kofman says. With this move, the Russians are signalling that since nobody is pursuing Minsk, they, too, will stop pretending, he says. Ukrainian politicians themselves are divided on how to solve the conflict, adds Yevhen Magda, a political analyst in Ukraine. "The first group realizes that the conflict in Donbass will last for a long time. The others are convinced that it may be solved quickly enough," he says. "Millions of Ukrainians are tired of war and economical failures." One of the politicians in the latter group, Ukrainian lawmaker Andrey Artemenko, is now facing treason charges for allegedly presenting a peace plan to U.S. President Donald Trump's associates without authorization from the Ukrainian government. In any case, says Kokcharov, the most likely scenario is that the conflict remains as it is right now because it fits with Russia's aims. With no peace in sight, families like the Yermolovich's and Salimov's will continue to bear the brutal brunt of it all. 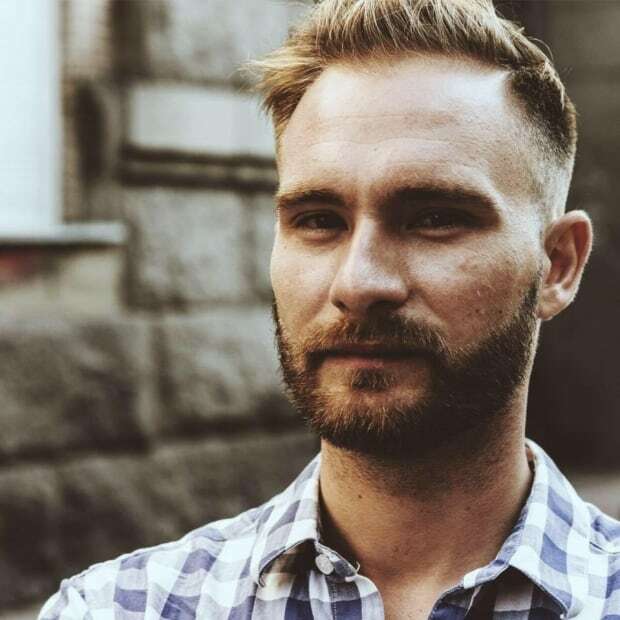 Christian Borys is a Canadian journalist primarily focused on covering conflict.